What was a rather dull backyard has been transformed into a fragrant, colourful and continually inviting place, where you can sit in privacy and seclusion. Although it is small, the site has the enormous advan­tages of being fairly sunny and sheltered, making it possible to grow many plants that might not thrive in a more open, exposed site. 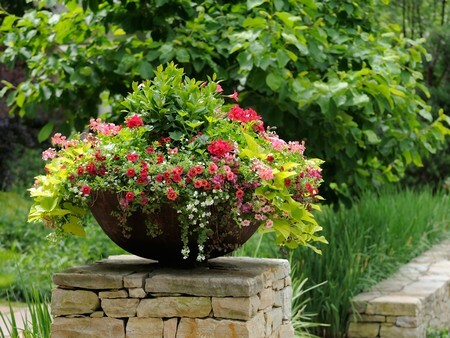 If you find that one spot does not suit a particular plant, the container can easily be moved to another part of the garden until the right position for it is finally found. Every possible space in this tiny garden is filled with colourful, fragrant plants. Containers, hanging baskets and tall wig­wams have been used to provide different opportunities for plants to grow in or up, while trellis has been added to the wall to allow climbers and scrambling plants to cloak it in greenery and flowers. The attention in this garden is definitely on the plants and not the walls or floor. These have been left bare and are not ornate or dec­orated. The floor area is covered with simple red, square pavers, which give a uniform base on which to build up the plants. The walls have been painted white to show off the plants and flowers and make the garden appear larger and more airy that it really is. A small curved bench is tucked away in the corner farthest from the house, where the garden can be enjoyed to full advantage from a sheltered, shady spot. Apart from the bench, however, there are no structures in this garden, mainly because there is no room but also because everything you want, from shade to colour and movement, is provided by the plants themselves. Container gardens offer endless opportuni­ties to grow a large variety of plants because nearly all plants can, at some stage – or even for all of their lives — be grown in a container irrespective of their natural final size. 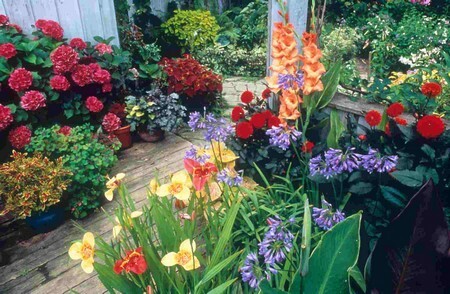 In some cases, growing plants in containers will limit their spread and growth, making them suitable for use in a garden when, in nature, they would grow too large. Ficus carica, for example, is a good container-grown plant that, if left to its own devices in the garden, can spread too much, as can rampant plants such as Mentha spp. (mint), which should be grown in containers so that you get the ben­efits of the plants but not their overwhelm­ing effect on the rest of the garden. Herbaceous shrubs and trees are often grown in pots, but it is easy to grow fruit bushes and dwarf apple trees in containers, too, widen­ing still further the types of plants that can be included in the scheme. Containers can be bought in a range of materials, including plastic, terracotta, stone and lead, but you can paint and decorate them yourself if you want a particular colour theme. They can be stood individually or, as here, in groups to make a display. 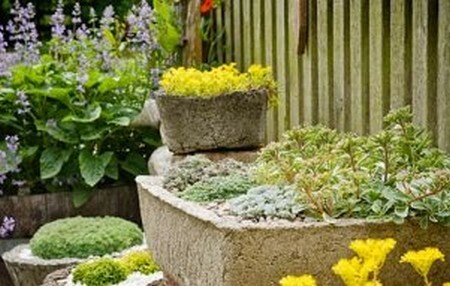 Because you can move them around so easily, you can create different heights and shapes with the planting, a flexibility that is simply not possi­ble with flowerbeds. In this garden no single plant or feature dominates, and the eye is encouraged to range freely. This actually makes the garden appear larger as visual stimulus and excite­ment is provided everywhere you look. Plants with unusual shapes have been used to add curves and interest. Allium ‘Globemaster’ produces smooth balls of pur­ple colour, while Zantedeschia aethiopica has stunning spathes of pure white thrusting up from among the foliage. Nertera granadensis (bead plant), which does best in dappled shade, bears yellowish-green flowers, which are followed by masses of red shiny berries. Hedera canariensis ‘Gloire de Marengo’ has cream-edged leaves that add colour as well as evergreen leaf cover to a large wall or trellis. Planting around the boundaries has been approached as if the garden were one deep flowerbed, with taller plants at the back and lower plants nearer the front. The difference is that plants here would not normally be found alongside each other. This is because every plant can be given a different type of soil, greatly increasing the range of plants it is possible to grow in a small area.